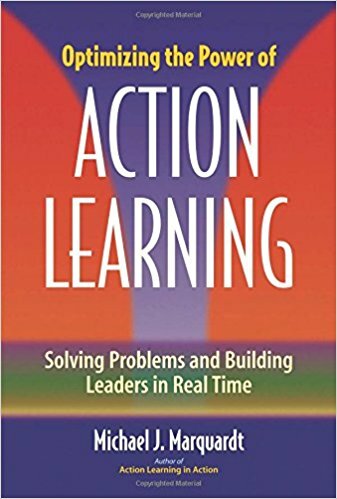 I would like to share my excitement for the effectiveness of a new approach to learning from experience called Action Learning. I recently completed my certification as an Action Learning coach and have already facilitated two workshops using the method. Action Learning is an instructional method of solving a problem in a group setting while learning from experience under the guidance of an Action Learning coach. And de facto engaging the group in an exciting collaboration lab. In an Action Learning session people discuss and reflect about a problem owned either by an individual, a group or a team. Dialogue is guaranteed by one of the method’s critical ground rules: “Statements can be made only in response to questions.” This rule is established at the beginning of the session and generates a spirit of inquiry that releases the pooled knowledge of the group to solve a problem. The process is this: a participant presents a real problem to the group and participants proceed to ask questions in order to understand the problem and come up with potential solutions. While the group is in this discussion, the Action Learning coach focuses exclusively on the learning that comes from experience and intervenes from time to time stopping the action to solicit learning reflections from participants. In addition, at the beginning of an Action Learning session the coach asks each participant to name a leadership skill he/she wants to work on. At the end of the session each individual receives feedback from the group on how he/she did in reference to that particular skill during the conversation. In this way, Action Learning serves the dual purpose of solving problems and developing leadership skills. An urgent problem that needs some resolution. The problem must not have an existing solution. For example, “What is the capital of Kyrgyzstan?” does not qualify as an Action Learning problem as only one solution exists; “How can I find out what the capital of Kyrgyzstan is?” does, as there are several ways for somebody to find out. is not a task force or a quality circle, because in those groups the purpose is exclusively to act while learning is incidental. In Action Learning, learning is one of the main objectives of the session. is not a simple dialogue, because the session generates action items as solutions to the problem that the problem owner commits to use in real life. is not coaching individuals about a problem, because the group generates the solution while the Action Learning coach only focuses on the learning of the group. One of the Action Learning’s elements that I found most important is that it uses one of the key findings of contemporary learning theory — that the process of acquiring expertise must be through applied learning and communication with peers and experts in the workplace, not with top-down communication.Action Learning addresses effectively the unwillingness of many organizations to send managers away from work to training and the common misconception of seeing learning as separated from “real work” and, ultimately, of little value. Why? Because Action Learning generates value and distills learning from experience while solving real-world problems. Peter Drucker’s 1959 idea of the “knowledge worker”—the visionary concept of a workforce whose primary job is to develop knowledge to, in turn, generate value fits to Action Learning to a T.
Yet, I worry about how far from this concept the reality of today’s workplace is, with the trainer’s job still shaped by the traditional model of an expert teaching with Power Point presentations!Colleagues, let’s step up our efforts! I announced my first Action Learning workshop “No Training! Action Learning for Managers” with an invitation that read: “Disclaimer: No PowerPoint slides were created for the design of this course.” and “Bring your work problems with you; we will solve them together and learn something in the process!” This set the collaborative and original tone that lasted through the highly enjoyable session. I might add that the session was also highly effective. Today, the demand for more and better workplace learning calls for a new generation of training that focuses on pooling and creating knowledge rather than on functions carried out more effectively by computers (like information-dispensing and skill-drilling). I believe Action Learning can be a useful additional tool in the repertoire of adult educators to address this challenge. What would an Action Learning team accomplish in your organization?